The Basilica of St. Clare of Assisi, realized with the typical pink stone extracted from the quarry of the Subasio mountain, contains precious frescos dating back to the period from the XIIth to the XIVth century. In the chapel on the right, along the unique nave of St. Clare of Assisi, finishing in transept and polygonal apse, you can admire the Crucifix which, according to tradition, would have invited St. Francesco in the church of St. Damiano in order to "reset up the Church". This chapel and the successive one are the remaining pieces of the pre-existing church of St. Giorgio and they represent the most ancient part of the edifice. In the crypt we have preserved the land remains of St. Clare of Assisi and some relics particularly well preserved: among them there is a frock of San Francesco and a cloth realized by St. Clare. 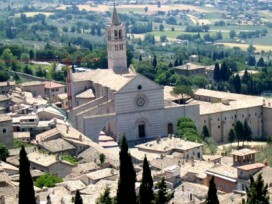 From the Place in front of the church, characterized by the presence of rampant arches on the side of the edifice and of the façade with central rose, you can profit of a large panorama, allowing during the days of clear sky to embrace in an unique gaze the Umbrian valley from Montefalco to Perugia. Born in 1194 in a noble family, the girl is baptized Clare in the church of Rufino, because the mother, when she was praying a few days before delivering, had eared a voice telling her she would have given to the world a "clear light" to enlighten it. During the years of education, the Saint also followed the crusaders in Promise Land. However, it was during the night of the Palm Sunday, on March 18th 1212, that took place the experience that determined a radical change in her life; in fact, during that night, the girl joined in secret St. Francesco at the "Porziuncola". As rituals of initiation the Saint was covered with the Franciscan frock and her hair was cut as a sign of penitence. For more than forty years she retired to monastic life in the church of San Damiano in extreme poverty and simplicity. Her Rule was officially approved in 1252 by Pope Innocenzo IV who, when he arrived to St. Damiano to give the benediction to the Order of "the Clarisse" also had to officiate the funeral rites of the Saint died on August 11th 1253. The rite was characterized by the fact that the Pope did not want that was song the mass of requiem but the celebration rite of the virgins.